[ARCHIVED THREAD] - 9mm Luger- 115, 124, or 147 gr? Which do you prefer and why? 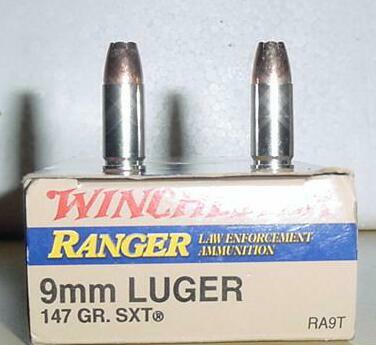 9mm Luger- 115, 124, or 147 gr? Which do you prefer and why? We are talking about self defense purposes? I like 124gr speer gold dots. Its what the Honolulu PD are issued and I like gold dots in general as self defense loads. I've always used 115s but I was wondering what the advantages or disadvantages of each would be. The heaviest possible grain projectile I can get and still feed reliably. Yes, lighter projectiles have more energy, but they do not have the momentum to keep going as far into the target. 124 +p Gold dots for me. 147 Gold Dot, Ranger or HST. 124gr +P Remington Golden Sabre in my XD. Comfortable with any of those in a modern design. Have seen tests where 147gr Gold Dots seem to expand somewhat more reliably through clothing than 124 gr. The authors of the tests theorized that the larger hollowpoint cavity could get more cloth plugged into it and still expand. 124gr +P Remington Golden Sabre Bonded in my XDG19. The 124 gr. & 147 gr. penetrate more consistantly to the FBI standard of 12" - 18". Bonded ammo is even more consistant. I use 147 grn Remington . Big and slow . Lower noise signature . I like the cheapest one at any given time. 124 gr, as that seems to shoot the best out of my 9mm carry guns (Walther PPS and a brace of BHPs). 115 doesn't group so well out of the BHPs (no real surprise given the twist rates), and the Walther doesn't really seem to like the 147gr. So Federal HST Bonded for me. Or Speer 124gr GDHP. No +p for me. I also like the 147grn the best, it hits harder and is subsonic for use with suppressors. 124 gr double tap GD out of CZ 75. I have not checked in a while but this is the last list I have from DocGKR for the 9mm. I prefer the 124 / 127 +P and +P+ rounds on it but recently also ordered 500rd. of the HST 124+P to try...they have not yet been tested so are not on this list. 115 gr cheap target rounds, I dont use my 9mm for home defense. I've used almost exclusively 115s, but I think I'm going to switch to something heavier before I buy more 9mm. I've never had a problem with 115s in my BHP or my SigP6, so I just kind of stuck with it. Looks like there are a lot more options for effective hollow points in heavier bullets. Thanks for all the info, fellas. Range work I stick with 115gr TMJ or FMJ which ever is cheaper when I buy components. For HD I use 147 gr Gold Dot. Range work/IDPA 115 or 124 plated. Whatever my reloading dealer has in stock when I buy. I've noticed no difference in reliabilty or accuracy. I avoid plain lead in 9mm, most seem to lead up the bore at 9mm velocity. For hollow points I have very good luck with Remington 124 Golden Sabers. In 147, well, never run 147. Can't help you on that. "If you carry a gun, people call you paranoid. That's ridiculous. If I have a gun, what in the hell do I have to be paranoid about?" 147's cause 87GN told me to. 147 grn reloaded by me. Similar to the Atlanta Arms competition load. Lowest recoil. Best accuracy, speed, and thus: score. This, and the reason is, I looked over the performance results real good. I carry the Corbon DPX 115g +P. Although this 115g is a little different. Its the solid copper hollow point. Yep. All of the official testing I have read has revealed the 147grn to have the best penetration. Bonded core loads are even better if you want to shoot through barriers. For target practice 115gr in my CZ75B, and 125gr in antique Lugers. The Lugers seem to need a bit more recoil to cycle the toggle reliably. In my Glock, which is for HD, 124gr +P Gold Dots. The carry gun is a Kahr CW9. Been carrying the big box 115 Remington jhp from Walmart, but will probably switch to the 147gr. Winchester jhp for better penetration. For practice, they both get the Win. White Box from Wally World. I voted 147 gn. I use the gold dots as well as the federal hydrashock. both great defensive rounds. Hornady 147 gr. XTP JHPs. Currently it's Speer GDs in 124+p flavor. As to why; I was able to buy a few cases of this stuff last summer for about $200/1000rds. Is it any better then the rest of the respected choices? I'd say no, but why pay more. Hornady 124gr TAP is my favorite, but I just got some Federal 115gr +P+ I'm excited to try. As of right now corbon 115's. Back in the day the whole light fast and hot stuff corbons ruled Supposedly. Now im smarter and wiser. When I get a 34 and break it in a new round will be bought for the 34 17 and wifes 19. Probably a 124 or 147 bonded.